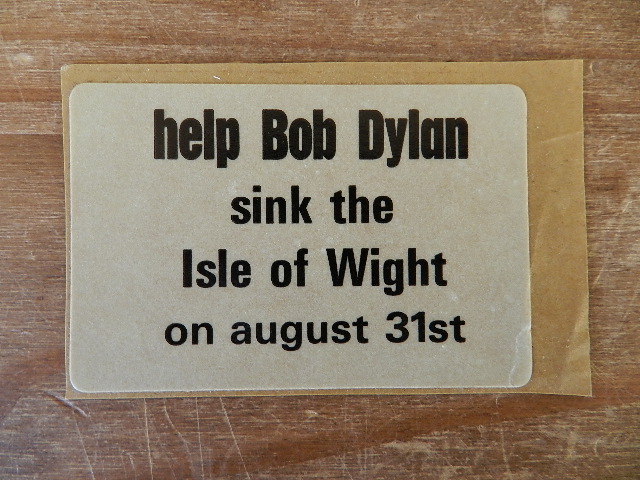 Bob Dylan sort of famously didn’t play Woodstock, a concert that was held not far from where he was actually living in 1969, but did play the Isle of Wight Festival two weeks later. It was his first complete concert in just over three years, and only his second live performance in that time (the other being at the Woody Guthrie Memorial shows). 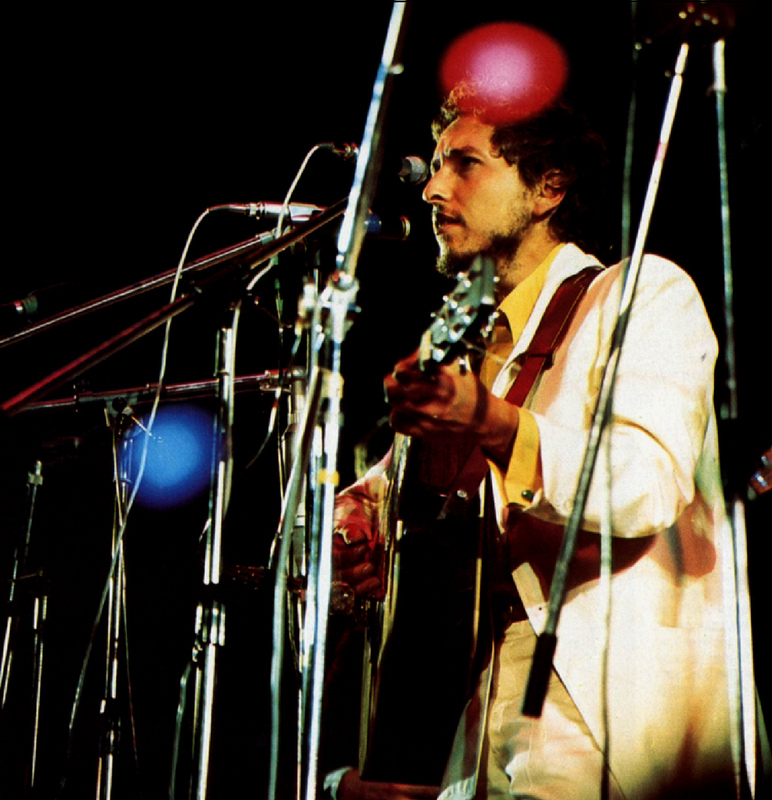 The festival attracted 150,000 people, and Dylan headlined the final night. Robert Shelton, in his biography of Dylan, basically downplays the entire thing, devoting only a couple of sentences to it, while other fans note that it was a widely bootlegged performance. Wikipedia makes it out to be quite the party, with a VIP booth near the front of the stage that included three of the Beatles (not Paul), three of the Rolling Stones, Eric Clapton, Liz Taylor and Richard Burton, Jane Fonda, Elton John, Syd Barrett and others. The show drew considerably larger crowd than the previous year, partly based on the rumours that the Beatles were going to join Dylan on stage and not just at the after party (where, apparently, they played an early acetate of Abbey Road). Dylan’s set was only an hour. He reportedly had another eight to ten songs rehearsed and would have played them if the audience had seemed to want it. The British press reported that he was semi-chased off the stage by an audience that (once again) didn’t get what he was doing, but other reports indicate that Dylan thought the whole thing went really well and that he was in a good mood after it, but that he performed for just an hour because the crowed seemed burned out. They do seem a little tired. They respond well to (the remarkably awesome version of) “She Belongs To Me”, the first song of the show, but their enthusiasm noticeably tails off as the evening progresses. The whole show was released last year as a bonus disc on the triple CD Another Self-Portrait. The recording is excellent, but it’s hard to gauge the audience response. The way that it is recorded it sounds like a small, appreciative crowed – certainly not 150,000 people. They react tremendously well to the older material like “Mr. Tambourine Man”, but seem a bit lost at the country versions of some of the material. While this wasn’t the first time that Dylan had performed new arrangements of established hits – something that has been his hallmark as a live performer for the past forty years – many of these versions are quite different than the recorded versions. “Like A Rolling Stone” is unrecognizable to the crowd from its musical intro – no one claps until the end of the first line as it is clear that they don’t see the song coming. Dylan messes up the lyrics, which is probably a function of the three year hiatus. I really like this version, but it is clear that the crowd doesn’t. I do laugh every time Dylan and Robbie Robertson forget the lyrics to the chorus. Speaking of Robertson, The Band is really great here, and it’s another example of how unfortunate it is that Dylan wasn’t regularly touring for this eight year period. 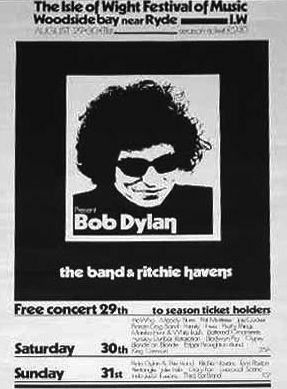 Musically, this is a very strong show, and given that almost every Dylan tour begins with a fairly weak show but gets stronger as it goes on (although some of them then burn out by the end), one can only imagine how good this group would have been had they done a dozen or more shows. 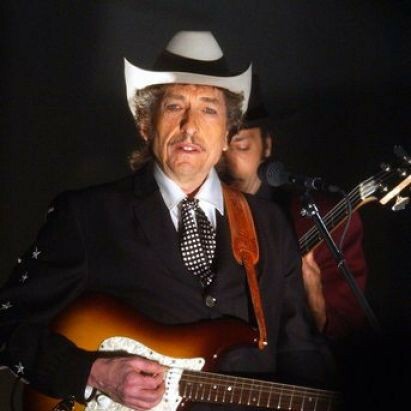 The show featured a lot of recent Dylan from the John Wesley Harding and Nashville Skyline era, material that otherwise didn’t get a lot of live performances, plus very unusual versions of “Maggie’s Farm” and “Highway 61 Revisited”. Three songs from the show wound up on Self-Portrait, including “Minstrel Boy”, which received its public debut at this show. I’m a fan of this show. I wish that he had done the other eight songs. I wish that it had been the launch of a tour. I wish that we didn’t have to wait until 1974 for more live Dylan with The Band, and that we didn’t have to wait for Planet Waves for a full album by Dylan and The Band. The collaboration between Dylan and The Band has another six years (weeks) to run, but this is that rare glimpse of how great things could have been. How good is it? It’s so good that I even listen to the version of “Rainy Day Women #12 & 35” that ends the set! A word on the second video. Colour footage (though no sound) of Dylan performing as seen from the VIP box to the side of the stage. You get to see all three of The Beatles in this clip (what the hell is on Yoko Ono’s forehead? ), but not the other celebrities. Sort of a bizarre thing, but there you have it. A word on the third video. Handheld footage from close to the stage of “I Threw It All Away” credited to Bobby Dylanski, presumably in an effort to end run Columbia’s lawyers trolling through YouTube. Then the sound drops out and you can watch Dylan perform “Maggie’s Farm” without hearing it. You can sync it with your recording if you really try. Then the sound comes back for “Highway 61 Revisited”, “One Too Many Mornings” (sound quality is brutal here), “I Pity the Poor Immigrant” . I do wish the bootlegger would have invested in a tripod…. My Great Aunt’s brother worked for the musician’s union in the UK. About 30 years ago he told me that it was standard practice for promoters to lodge 10% of a performers fee with the union beforehand. Th promoters arrived with 15,000 pounds for Dylan for the Isle of Wright and the union told them no just 10% not the whole fee. They were astonished to learn that 15K was 10% of Dylan’s fee.